Calla Lily is a spa with tea room that is perfect for a special day with Mom, Sister, or BFF. Didn’t you a well-planned tea party when you were younger? Calla Lily Tea Room gives you or your children the chance to live out that childhood fantasy. Whether you’re just stopping in for lunch or planning a party, this tea room has it all. Located in downtown Aurora, the tea room and spa are open to the public Tuesday through Saturday leaving Sunday open for private events. Guests can enjoy sandwiches, soups, salads, scones, fruit, cake, and other assorted pastries while sipping tea with their friends. If you’re thinking about hosting a tea party at the tea room, the shop offers five different meal packages and two dessert packages for with packages ranging from $11.50 to $24.95 per person. If the occasion fits, pair it with a relaxing seaweed wrap or other indulgent service. To book, a $100 event fee is required for the first two hours and $50 for every hour after. Not only is Paramount Theatre one of our favorite family-friendly places in Aurora, IL, it also makes for a unique and fun party venue. Believe it or not, this Theatre in downtown Aurora has some of the best event spaces in the area. 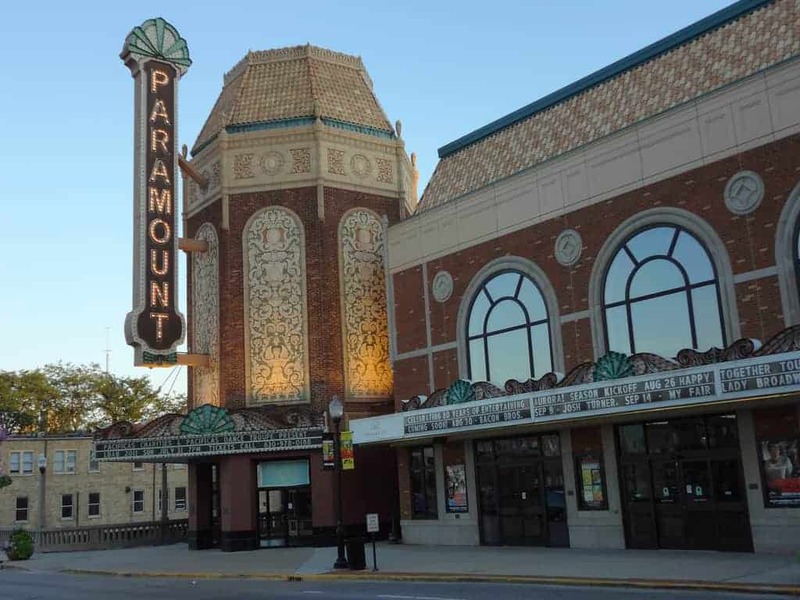 Overlooking the Fox River and the downtown skyline, the Paramount Theatre offers five different venues for parties of all sizes. You can even rent the entire Paramount Theatre auditorium if you want! Host a simple birthday party in one of the beautiful ballrooms, or go all out for your anniversary party or bar mitzvah in an elegant auditorium with a stage for entertainment. For $100 more, the Chief’s package includes all the decorations and fire station-themed paper products for serving. Food and drinks are not provided with either package, but you’re free to bring in any outside food to help celebrate your young one. A fancy event at a brewery? Our top choice for party venues in Aurora, IL was once an old train roundhouse. Two Brothers Brewing has renovated the space into a surprisingly beautiful establishment. At the property sits a restaurant, a coffee shop, a few stages for entertainment, and an outside courtyard complete with a cute gazebo. The venue is perfect for weddings and parties, but what makes this place unique is the train station next door. The railroad nearby is constantly bustling with Metra trains to Chicago, Amtrak trains, and other trains passing by with consumer goods. Trains can be heard all hours of the day, making Two Brothers a great spot for locomotive enthusiasts or historical lovers. Enjoy locally sourced food and craft beer that is brewed in the nearby city of Warrenville. You’ll definitely feel the suburban vibes here!